You can comfortably gather six people around this stylish, mid-century modern table. The unique angle of its legs and the subtle two-tone finish draw your eye in as a result of the otherwise simple construction. 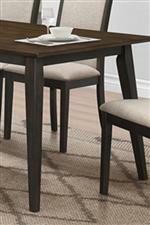 The Studio 26 Mid-Century Modern Dining Table by New Classic from Boulevard Home Furnishings. We proudly serve the St. George, Cedar City, Hurricane, Utah, Mesquite, Nevada area. Product availability may vary. Contact us for the most current availability on this product. This funky, mid-century modern collection is perfect for entertaining. 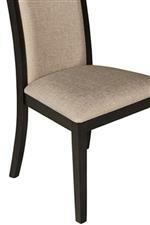 Get comfortable in plush upholstered chairs and grab a bottle of wine from the server's built-in wine rack. 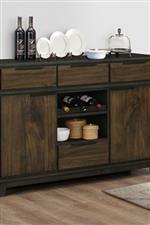 The server is a stylish storage solution with additional features like felt lined drawers and adjustable shelving. You'll really get the most out of style and functionality with these classy, metropolitan pieces. The Studio 26 collection is a great option if you are looking for Mid-Century Modern furniture in the St. George, Cedar City, Hurricane, Utah, Mesquite, Nevada area.